A Respectable Appearance . . .
And a nice dress/casual shirt helps too. There are so many designers of shirts and so many different styles one can choose from you may suffer from a case of vertigo. At the end of the day, most designers will have something you are looking for when building your wardrobe and creating your own style. There are a few kinds of shirts one should be interested in. I’m not speaking of the classic, modern, and slim fit. I’m speaking of tab collar, collar bar/pin and flip-cuff shirts. The latter is of the casual flavor. In the featured pic, I am wearing a collar bar shirt. Eyelets in collar accommodate a collar bar as well as a collar pin. It is truly a classy look that will up your overall appearance. The main idea behind the collar bar/pin is to accentuate the tie one is wearing by pushing it up from the shirt. Its genesis is from the 1920s and has been around for many decades. Finding collar bars and collar pins are easy. 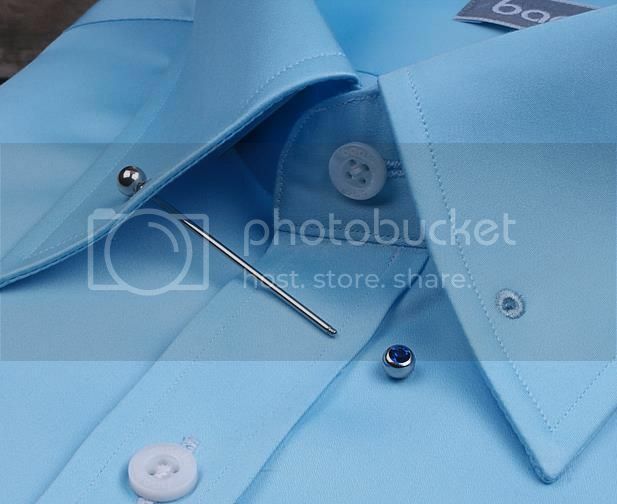 Finding a collar bar/pin dress shirt is not as easy. The price point is high. In addition, having them custom made may be the way to go which may also be pricey. But, if you keep searching you may end up lucky as I did. The J. Todd dress shirt was purchased on Ebay for $16.99. It’s a regular fit shirt but it fits like a slim. Apparently, it was a Marshall’s, Inc. brand and it was made in South Korea (daebakiya!). The shirt fits perfect so to say I was rather impressed is an understatement. Although I would have preferred the standard white dress shirt, burgundy is very versatile. The tab collar shirt eliminates the need to wear a collar bar or a collar pin. Also, they are easier to find! The picture to the right is to show what one is dealing with. I might as well consider Ebay my go to from this point on. I won the Robert Talbott dress shirt for $19. It is grey and has a very small checkered print. And I basically stole the Oscar de la Renta tie for 99 cents. Yes, 99 cents. Robert Talbott‘s shirts range from $195-$425 on Nordstrom’s so I will not state the obvious on this one. The next style of shirt one should add to their respective repertoire is the flip-cuff. The flip-cuff is self-explanatory. It’s an added dimension to one’s style. If you are a fan of the show Modern Family, you are aware Eric Stonestreet’s character Cameron fancies the flip-cuff shirt. Traditionalists may will find them rather unattractive and abhor them. I do not go crazy with some of the patterns but I do like them very much. As I wrote about in a previous post, I have a unstructured blazer with functional buttons. Flip-cuffs solve the problem when going very, very casual. The standard seems to be the oxford blue when flipping the cuff as seen in the picture to the left. I own a few flip-cuff shirts such as Alexander Julian, Nautica, Van Heusen, and Calvin Klein. I recently added an Egara, a Jhanes Barnes, and a Robert Talbott. Egara, pictured to the left, is a Men’s Warehouse brand. It is a slim fit, made of Egyptian cotton and I purchased it for $15 on Ebay. The picture to the right is a Jhane Barnes slim fit flip-cuff with some avant-garde designs that was purchased for $20 on Ebay. Although she is no longer doing menswear (her final collection was the Fall of 13), her clothes are still out there and can be bought at a nice price. Flip-cuffs are nice if you like to roll up your sleeves. I rarely roll my sleeves up. When I do, it will most likely be when I am wearing a waistcoat. What you are searching for depends on whether you desire to go conservative or wild with the color palette, roll up your sleeves or solve the problem of functioning buttons on your unstructured blazer. Until next time, keep doing your research and keep experimenting to find your ultimate style! Jal ga!